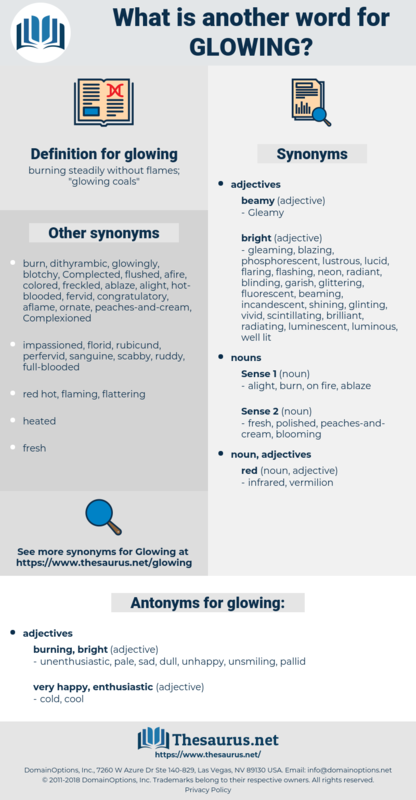 What is another word for glowing? 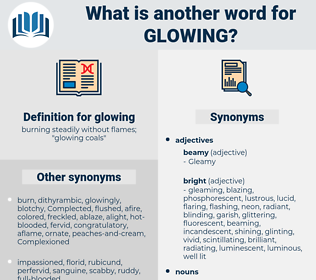 burning steadily without flames; " glowing coals"
radiant, enthusiastic, glittering, warm, light, vibrant, gloss, illuminated, glorious. laudatory, brilliant, luminous, complimentary, bright, shiny, glossy. unenthusiastic, pale, sad, dull, unhappy, unsmiling, pallid. ashy, darkened, darkish, peaky, pitch black, obscure, lowering, sallow, black, dispassionate, dismal, regardless, Darksome, Paled, impersonal, unconcerned, objective, cloudy, darkling, purposeless, melancholy, gloomy, mealy, livid, sickly, lackluster, lightless, shadowy, blank, Whey-faced, glowering, calm, murky, listless, flat, indifferent, somber, reserved, dimmed, frowning, blanched, peaked, unlit, dusky, leaden, whitened, pitch-dark, uninterested, dry, pasty, bloodless, unemotional, glum, scowling, emotionless, waxy, heedless, depressing, stony, white, dim, blackened, stolid, stoic, impassive, glaring, ashen, negligent, palish, sick, Sallowish, dark, undemonstrative, cadaverous, frigid, gray, lurid, unmoved, phlegmatic, waxen, sullen, tenebrous, sunless, apathetic, shady, careless, detached, doughy, anemic, unmindful, darkening. And she raised her eyes, glowing and brilliant as stars. The woman, however, suddenly seized the man's hand and covered it with glowing kisses. visible radiation, light, visible light.